This is a unique beach cottage and a great location,(Ocean side of Route 1 and approx. 250 feet from the beach). It has a large screened porch with picnic table and chairs for reading your favorite book and evening cocktails. The cottage is located on the same street as the famous Rusty Rudder that has several restaurants and shops. There are dozens of restaurants, night clubs and eateries within a few blocks. Nearby is Rehoboth Bay one of the world's most famous windsurfing locations. The ocean temperature in July, August and September is approximately 75 Degrees. The beach is perfect for boogie, surf and skim boards. The cottage has off street parking for up to 4 cars saving you expensive daily permit fees. This cottage has it all. It is the perfect place to spend your vacation. This will be your vacation spot that you shall always remember and you will want to return to. We provide an easy three step rental process. 1. Contact us via phone or email. 2. We email you a contract for you to fill out and mail back to us. We can only hold your requested week for 7 days. If the contract is not received back to us in 7 days, the week is opened for other renters. Your vacation week is not confirmed until this contract and deposit is in our hands and you receive an email stating your week is now reserved. 3. We will email a letter before your stay with further details to make your stay comfortable along with how to enter the home. Note: We only rent to people who will care for this property, who will leave this retreat in the same condition they found it in. We rent Sunday to Sunday. We consider ourselves local residents since we have been here every summer of our lives. We love the beach, the bay for sailing, the many restaurants, the beach, the biking, the beach, the golfing, the beach...you get the idea. We have been summering here forever. For us, Dewey is a way of life. We get homesick if we have not walked barefoot on this wonderful beach every month. We had to buy so that we could always come back. We are unique because we are one of the original cottages in Dewey Beach. It has been kept up impeccably. We pay attention to the details and everyone who has stayed there cannot believe how clean it is. This is a separate house offering privacy unlike most condos and townhouses. There is parking for four cars. The house is a short distance to the beach meaning you can leave your beach gear on the beach and go back to the house for lunch or refreshments, not to mention a bathroom break. This is truly convenient if you have children. We are about 250 feet from the ocean. Our week couldn't have gone better. The house is wonderful. The pictures don't do it justice. The living room/kitchen area is open and comfortable. the front screened in porch is beautiful (my personal favorite hangout spot for the week). The location is amazing; you are just a few doors down from the beach and an easy stroll to all the fun things that Dewey has to offer. Being set back off the road was a blessing. I've stayed in a couple different places that were right in the thick of Dewey and was frequently woken and never got a chance to relax. This is the perfect blend of a quiet beach house with access to the Dewey shenanigans. The owners are incredibly friendly and responsive. We can't wait to do another trip! The cozy beach cottage was an adequate size for our family. The closeness to the beach and bay can't be beaten. We enjoyed hanging out on the porch which could fit all 8 of us just fine. The owners of the house were great to work with and responded to question in a reasonable amount of time. We are glad to hear our cottage was adequate. We are about 250 feet from the beach, which makes it very convenient to be able to leave your belongings on the beach and walk back and forth to the cottage during the day. You can also walk to many places in Dewey to get lunch and/or bring lunch back to enjoy on the beach. We also work very hard to communicate with our guests to make their stay enjoyable and make lasting memories. Very enjoyable property, we loved our stay. We had 7 adults, 3 children, and a Labrador Retriever and it was perfect. The property is very well maintained and clean (you wouldn’t guess it was a pet property), we were pleasantly surprised at how well stocked the kitchen is - plenty of cookware and dishes, wine glasses, specialty cooking items, and all brand new stainless steel appliances. Between the hose, outdoor shower, and two bathrooms we had no problem cleaning off from the beach. The screened in porch was lovely, kids liked eating at the large picnic table, adults enjoyed sitting outside with a cup of coffee in the morning. Two grills and a large patio in the back make for great entertaining. Large TV in the living room. There were enough separate places between the outdoor patios, loft, and house, that the kids could play separately and give the adults some grown-up time. We had a snafu with one a/c unit (that was unpredictable, not due to any issue with the home) and the owner Charmine was incredibly fast and responsive. She sent someone out immediately to replace the a/c unit and followed up to ensure that we were comfortable and our needs were met. Excellent service and communication. Laundry facilities on site were great. Parking is a bit of a challenge, but it didn’t bother us. There are spots for 4 cars and you must park single file, so we just needed to be strategic about who parked where to allow for ease of driving. With all the nearby restaurants, shops, and beach that wasn’t an issue though. Would definitely rent from again - perfect location for several families and very pet-friendly! Thank you for your kind words. We are happy that you had a great vacation. It was a joy working with you. We hope you come back to our cozy cottage again. 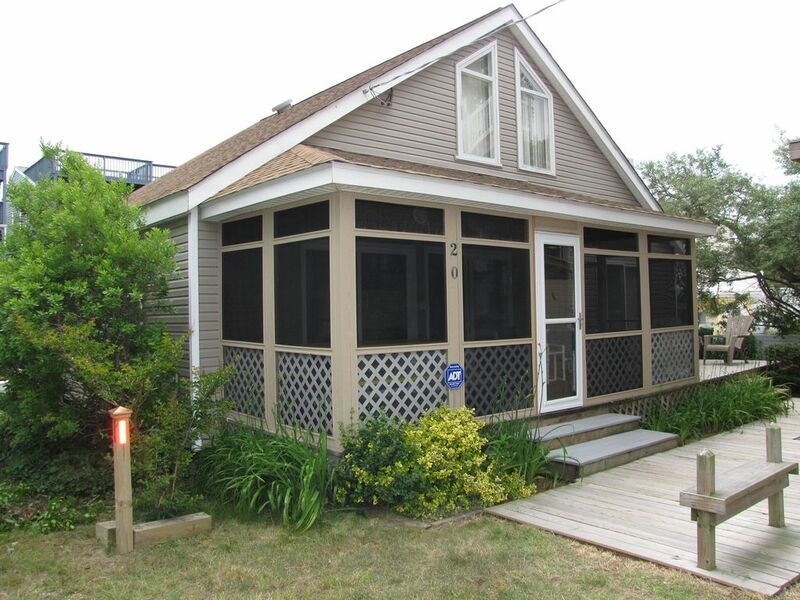 In the land of Dewey Beach there are few small cozy single homes left. This is one of them. It's a bit of a throwback in terms of architecture but it fits right in with "shore" decor. The owner is very responsive not that we had issues. I'm speaking from a "pre-rental" and post contract period. If I had questions they were answered via email or voice within 18 hours. Given its location to the beach, it's a good buy (rent). You won't find anything better price wise. Just steps from the beach and from the Rusty Rudder - best of both worlds. Comfy beds, remarkably huge and nice TV, great open living room. Probably the best place we have stayed in so far in terms of coziness and closeness to everything. Loved it and will be back for sure. Stayed the week of July 4th, 2011. Went with a bunch of friends (20 somethings.) Steps from the beach and short distance to the heart of Dewey! Really enjoyed the screened in porch, outside shower and huge TV. I don't think there was a grain of sand found upon arrival. House was clean and obviously cared for through the years. Owner is extremely helpful and genuine...looking forward to a return trip to Dewey!